From the time when I was in junior high school until I was in my early twenties, I was interested in overseas cultures. I loved the European and American cultures in particular and learned English from listening to music and watching movies. I actually disliked Japanese culture but only because I didn’t know much about it and wasn’t interested in it (laugh). 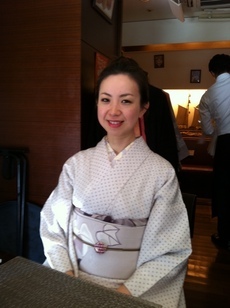 Since living abroad, I have been absorbed in Japanese culture, kimonos in particular. Young people from many different countries used to gather gathered at the language school. I found that i n comparison to people from other countries, most Japanese, including myself, didn’t know much about our own country. I felt embarrassed about this. After I returned from living abroad, I read some books about Japan. I also traveled to other Asian countries to broaden my outlook, and even changed my sense of values. Though, I hadn’t ever been interested in Asian countries before; I knew that they had many things which the Japanese had lost. I came to think that I want to teach the world’s people about Japanese culture and our good points. As one of Japanese culture, I was fascinated by beautiful kimonos. I started taking kimono lessons immediately but failed in learning the way wearing a kimono at first. When I quitted a kimono school, I happened to meet my friend who wears a kimono, and I thought to myself, “I want to wear a kimono like her!”, (I truly felt this in my heart). I felt at that moment that this was something I could do forever. I now can wear a kimono on my own. So I can wear a kimono by myself now that I can go anywhere wearing a kimono, not only to Japanese cultur al events, for example, rakugo(comic storytelling) and kabuki but also to a restaurant for dinner, a classic al music concert and so forth. I enjoy wearing a kimono to events because I feel so feminine. My movements are so natural and clerks treat me kindly.